Roach`- Without him, we would be nowhere! The cyanogen mod team as their source made implementing our quick controls a lot easier. This is a completely deodexed rom, based on the 3.2 wifi system image. 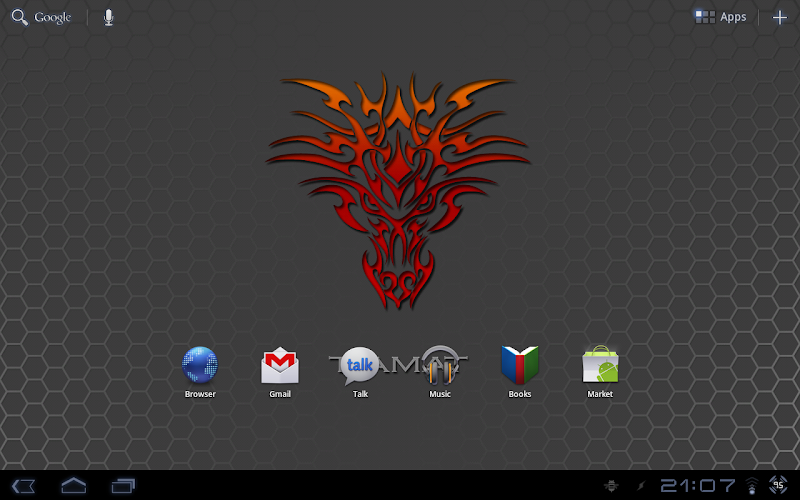 However just because Google and Motorola haven't released 3.2 for the verizon xoom that doesn't mean we don't support it! Thats right. We support 3g devices on 3.2 before Google have even released it. Quick Controls aka statusbar controls / "Zeus mod"
Fast boot times. Your boot times are simply amazing with this rom! Complete localisation support. This means that we have complete support for european devices and their languages. 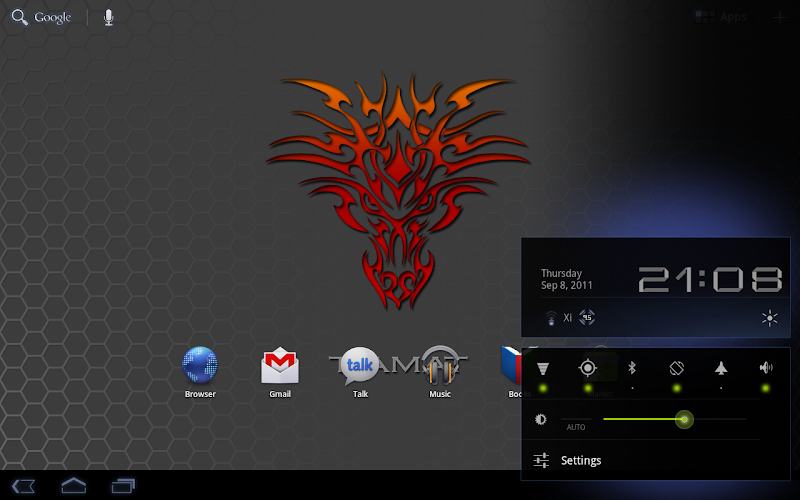 Powered by Tiamat Kernel Tachi 2.1.0 (stock gpu). Modified battery images & animations. Applications files (apk) located in /data/tiamat_first_boot_install will automatically be installed. Your microsd card is now mounted at /mnt/external1. You will also be able to access this via MTP. If you're not on hammerhead, you need to perform a factory reset first. This rom supports all wifi devices, US Verizon 3g devices and European devices. Prerequisites: Clockworkmod Recovery card for installation. Perform a nandroid backup, and keep this safe! Perform a factory reset within recovery (Wipe data / factory reset) This is only required if you're NOT upgrading from hammer head. You are able to flash 2.2.1 over 2.2.0 as it is mainly just bug fixes. Boy has it been a busy last 2 weeks. I have built a build system where we now do the majority of our coding in java. Yep java, not smali. We now have quick controls, in the status bar settings menu. This rom is mainly just a feature release. Unfortuantly if you had any issues regarding gmail in hammerhead, you will likely get the same issues in this release. This rom is also still based of 3.2. Yeah I know I said I would be doing 3.2.2, but things change. The browser UA string setting now sticks. Reverted to the stock User Agent string. Disable OTAs by default. You can turn them back on through the settings. 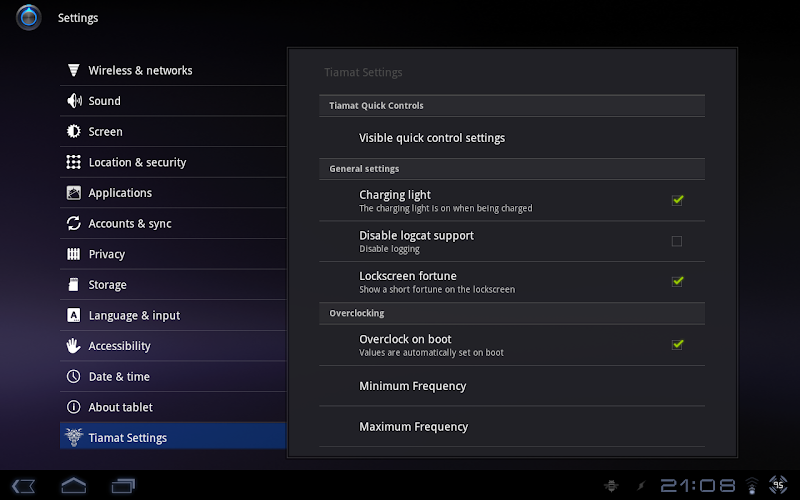 Ability to turn on the european wifi channels in the settings menu. We now use the GMail.apk from the Asus Prime rom. Re-implemented the shutdown (power) menu. Brought in DSPManager from cyanogenmod. You can also access this through the Music2 Application. Fixed various force closes in Music and Clock applications. You are now able to enable wifi & bluetooth via quick controls while airplane mode is active. You will need to enable this through the quick control settings first however. Disabling rotation in the quick controls will now freeze the rotation of the screen, instead of locking at the landscape position. More support for the Hong Kong partition layouts. Overclocking will now write the values to both cores. 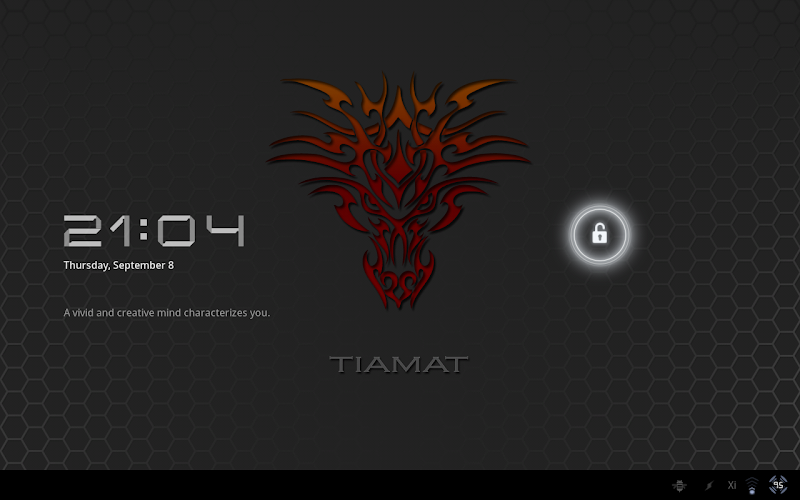 Tiamat Settings - set your overclock on boot, and many more! Browser now has a selectable UA string in the general menu, no more enabling the debug mode. There is a nice fortune displayed on the lockscreen now. Fixed all the application signatures - Google applications should update fine now. European 3g support should be 100% working now. Updated the maps application. NOTE: This is just a temporary fix, and we are working on a permanent fix. Rebased off the 3.2 wifi image. usbOTG drives now mount at /mnt/usbOTG and act identically to the sdcard. Now comes with the Katana 2.0 stock GPU kernel. Automatically modprobe all kernel modules, apart from the wireless module. Removed the charging percent text from the pull up settings. When charging, it will now alternate between the battery percentage in the middle and a charging symbol. Fixed the dependency that the ramdisk had on busybox, specifically run-parts. Enabled the led charging light in the ramdisk as per popular request. Fixed permissions in /system/bin. This was causing issues with 3g connections. Replaced framework-res.apk with a less modified version. There is no SIP calling and sms now, but the activation screens work now. Last edited by solarnz; 10-09-2011 at 03:22 AM. Join me in #xoom on freenode.net. why the downloaded file is named as 2.2 instead of 2.2.1 ??? Last edited by LPHS; 09-17-2011 at 10:26 PM. So, I have to do a complete factory restore, will I lose my root? Does this re-root? New to this so sorry if it's a dumb question. An I'm on 3.1 does that matter? had you interchanged the link prior to this ?? I've been getting bad file cant open to both of the versions..... downloaded multiple times. Is there another download link maybe? Dang, this comes out right as im at the tail end of recalibrating my battery! oh well, gonna download and i'll flash after im recharged. at 3% left, so shouldnt take too much longer to run down. Just for confirmation, the Tachi OC'ed gpu kernel and Arcturus are compatible with this rom, correct? I think i read that they were 2.2.1 compatible. Last edited by Sardo Numspa; 09-18-2011 at 04:07 AM.